In WordPress, navigate to Plugins > Add New. Search for “Data Tables Generator by Supsystic” and click install. When the installation has completed click “Activate Plugin”. You will have a new admin menu item titled “Tables by Supsystic”. Enter the title of the table, set the number of Rows and Columns. In order to change the configuration of tables – open the “Settings” tab. Here you can set all of the options of Data Tables Generator plugin. Caption – display the title of the table. Description – short description of the table between title and table. Header – display the first row as a header of a table. Also, you can set amount of rows which will be moved to the header. Signature – add signature under table footer. Footer – display the first row as a footer of a table. Fixed Header – allows to fix the table’s header during table scrolling. Fixed Footer – allows to fix the table’s footer during table scrolling. Fixed Columns – allows to fix columns during table scrolling. Left/Right Columns Count – number of columns to fix by the left/right side of the table. Disable Table Cache – This feature is necessary for those cases when the table contains the shortcodes. By checking the box, you can make sure that they will be rendered correctly and won’t be influenced by a cache. Important! After changing the settings of plugin don’t forget to click the “Save” button. Learn more about Table elements here. Here you can activate additional functions to work with the table. Standard Responsive mode – in this mode if table content doesn’t fit all columns become under each other with one cell per row. Searching – enable search by the table. Save Editable Fields – allows saving data to the table through editable fields. Use Editable Fields for Logged In Users Only – allows using editable fields only for logged in users. Front-end Export – allow printing the table or export to PDF, CSV, XLS on the frontend. Export Page Orientation – choose the page orientation for PDF export file: portrait or landscape. PDF Export Font – if you use some specific characters (Greek, Cyrillic etc.) it is better to check this box for PDF export. Export Logo – automatically adds selected logo for output PDF or printing. Auto-import from Google Sheet – If checked – table data on the frontend will be overloaded from selected Google Sheet. Read more about how to organize Auto Import form Google Sheets. Read more about Front-end Editing Feature. Otherwise – you can set a table width manually: columns width will get from Fixed Table Width option (toolbar on Editor tab) or calculated depending on the width of the column in the table editor. 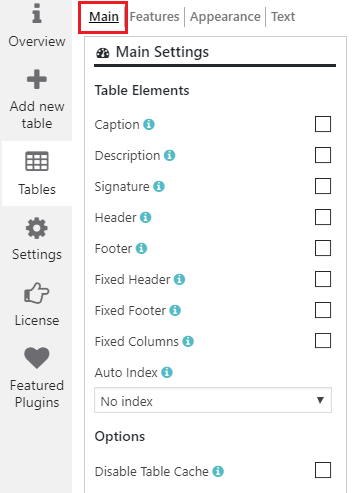 If you do not want to apply columns width at all – you should uncheck “Auto Table Width” option, set “Fixed Table Width” option to “auto” and check “Compact Table” option. Paragraph Mode – This mode allows you to separate the content into paragraphs. To move to a new line in the cell – please press CTRL + Enter. Borders – add borders around cells or rows. Compact – reduce the amount of white space. Use custom styles – choose your custom table styles below. Any settings you leave blank will default to your theme styles. Borders external – set the border colour and width in px. Borders header – set the colour and width for a header. These settings apply to a header, footer and “search by columns” field. Borders rows – set the colour and width for a header. Header Font – select the font for a header (the same for a footer), font size and colour. Cell background – select the colour for a cell background. Cell font – select the font for cells, font size and colour. Search Bar Colors. Here you are able to set the colour of background, font and border. Vertical alignment – set the vertical alignment of table cell contents. Horizontal alignment – set the horizontal alignment of table cell contents. You have the ability to display the table or even its individual fields from the database – straight away on the front-end. Enable the option “Data from Database”. Select the table as a data source. In this list, you select the existing tables and views that you want to copy. Select the table fields. Only the selected fields will be used to build the table. Allow to Edit Data. If enable, let you edit database table data through the frontend fields. Select the fields available for editing. If nothing is selected, all fields will be editable. Save Frontend Fields. Allows saving data to the database table through the frontend fields. Use for Logged In Users Only. Allows using frontend fields only for logged in users. Allows using frontend fields only for users with selected roles. If there are no chosen roles – all logged in users will have the ability to use the frontend fields. add a diagram or make some fields editable. After you change some settings – with responsive data tables plugin, you can immediately see the result – in “Preview” and check the appearance of the table on Desktop, Tablet, Mobile view. Note that the table may have minor changes depending on the style that your theme has. Diagrams feature (PRO option) allow you to visualize all the necessary information just in few steps with simplest settings. 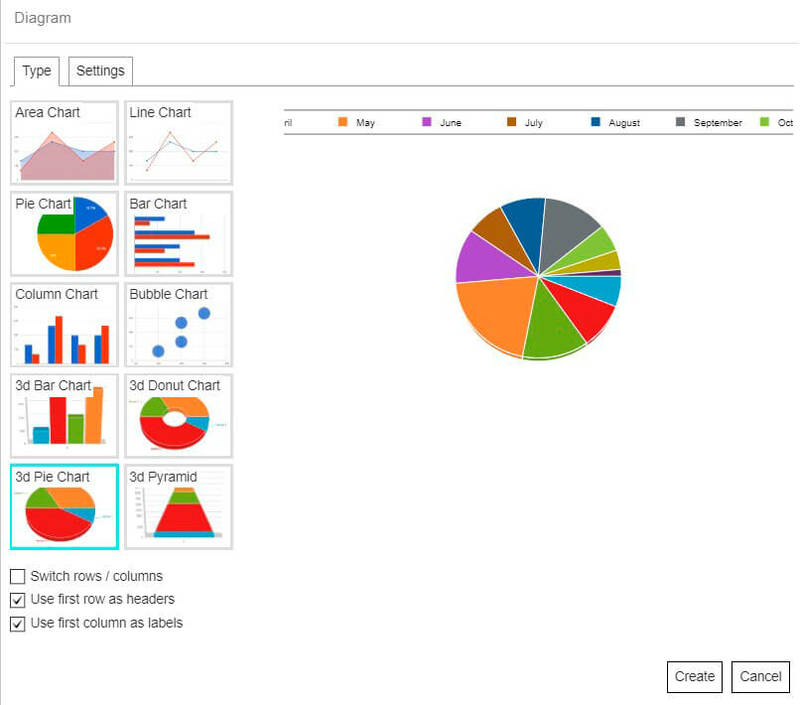 Check all the examples of charts. Table History (PRO option) lets you create editable tables for your logged in users and easily view the changes. It is and you can find it on the main settings menu of your Data Tables plugin. Each of your users will be able to edit your table. Information about table changes will be displayed on the History Table tab, where you can select a user from the available list to check it. Also here you will find a date and time changes. On the left navigation menu click “Tables”. Open the table which you need and copy the shortcode. Paste the shortcode into your post or page and Datatable plugin by Supsystic will automatically create a table on your page. There are several ways to add a table to the site content. Back to WordPress Data Tables Documentation. 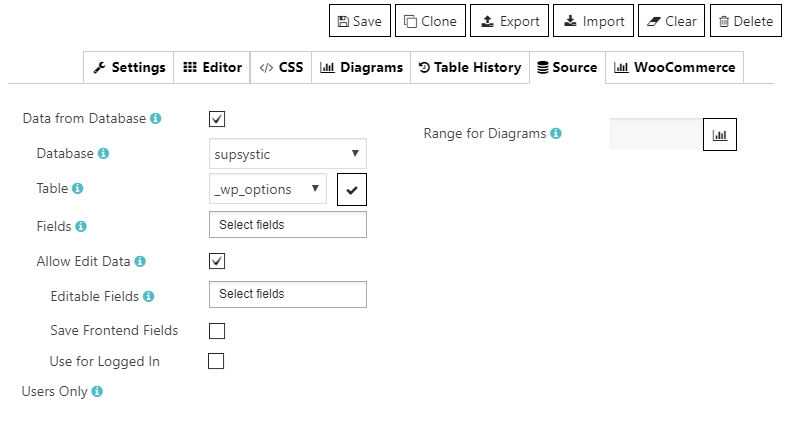 Back to the main page of WordPress Data Tables Generator.